Discover Coolsculpting, the latest fat freezing non-surgical and innovative way to redefine your silhouette. Lose unwanted fat you can’t remove with a healthy diet and exercise regimen. At Epilium & Skin, the first Coolsculpting consultation is free. You will be able to discuss the treatment with one of our doctors or nurses who specialise in aesthetic silhouette shaping. Our specialist after answering any questions you may have, will recommend a customised treatment plan to achieve optimal Coolsculpting results. Then, he will take photos of the areas where those annoying fat cells and folds have appeared. Epilium & Skin will hold these pictures as part of your medical record, so that you can compare then with your new and improved shape following the completion of the treatment. 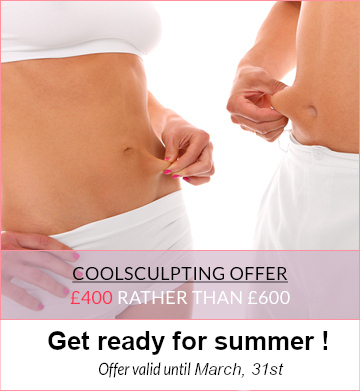 Epilium & Skin will then give you a quotation for the Coolsculpting treatment and a consent form to sign. But do not worry, you will have plenty of time to make your decision with the knowledge of all the facts and understanding of the process. Coolscuplting, developed by the medical technology company Zeltiq® is the only FDA approved fat freezing (cryolipolysis) efficient device to remove unwanted stubborn pockets of fat on most body areas. Coolsculpting is a non invasive fat reduction procedure therefore without surgery nor downtime. The cryolipolysis device cools fat cells to the point of death on localised areas such as hips, abdomen, saddle bags, love handles, arms or thighs. Without needles or incisions, Coolsculpting is furthermore the best non invasive solution for targeting reduction of bumpy fat pocket and reshaping your body . This revolutionary, advanced cooling technology requires no anesthesia and is a safe and non-invasive procedure that can be performed without hospitalization. In less than 3 months, your body will naturally process the fat and eliminate those dead cells. As fat cells do not renew therefore a single treatment is necessary unless you want more important results. We tailor each treatment to the needs of every individual patient depending especially on their physique and goals. Book first of all a consultation with our trained clinician to discuss your cosmetic concerns and goals. Our expert will suggest you the best body contouring solution to reshape your body at affordable prices. In addition, we propose a consultation with our Nutritionist because a healthy diet will enhance your results.